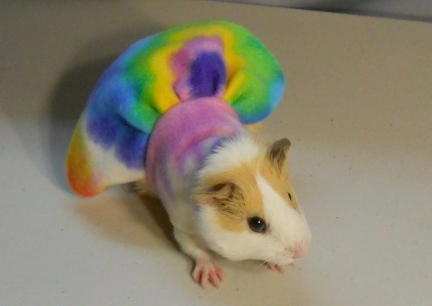 When I came up with the idea to dress my small animals my husband thought I had lost it for sure. Now, even Deron has to admit, the little guys really are cute dressed in their little outfits and costumes. These little dresses are made in a variety of ways. 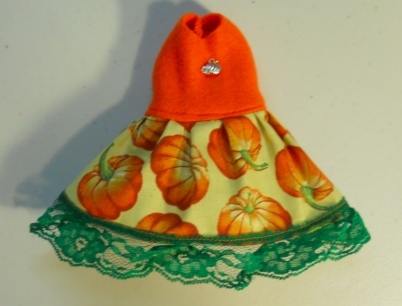 This one is a Cute Pumkin Print Dress with cute little silver toned Pumpkin Charm! I wish the photos showed the outfits better then they do. Please measure your Guinea Pig before ordering these items. Each item may be of a little different size as they are all hand made, and every animal is built a bit different. I try to change sizes a bit so that every small animal can have a new outfit to show of in. The waist measurement on the Dress is approx 11.5", it does have a bit of stretch in it, and the outfit is approx 8" from neck to tail. HAND CRAFTED IN OUR NW SD USA NON SMOKING HOME! All the money you spend with us goes to care for our animals. We, as well as they, appreciate your business. YOU ONLY PAY SHIPPING ON ONE ITEM PER ORDER. THAT'S RIGHT, YOU ONLY PAY SHIPPING ON THE HEAVIEST ITEM PER ORDER WHEN YOU SHOP WITH US....SO PLEASE, KEEP SHOPPING, ALL OTHER ITEMS SHIP FREE! This product is in-stock and ready for delivery.